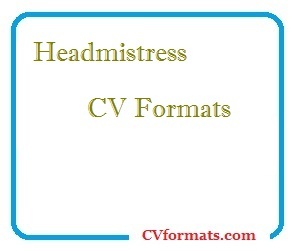 Mentioned is the way you can write Headmistress CV Template . People looking for jobs can easily download these Headmistress CV Template in word or pdf format or just view it online to copy and paste. Cover letter of Headmistress CV Template is also available. Just change the name , address , qualification and experience and your Headmistress CV Template is ready. 1978 Masters degree in Textile design from National College of Arts Lahore. 2008 till date –Beaconhouse School System, Lahore. 2005-2008 –Beaconhouse School System, Lahore. Educational research – including, teaching methodology, classroom management, curriculum development, methods of assessment, and learning styles. • Organise and conduct training programmes for the effective implementation of the English, Mathematics, Science and Social Studies Curriculum, Classes I – V.
• Evaluated Beaconhouse Defence Campus Karachi as a team leader in 2016. • Evaluated Beaconhouse Gulshan Primary Karachi as a team leader in 2015. • Organized Open day on a large scale. • Attended the second part of the course on Strategic Leadership of ICT by Richard Pietrasik from Edinburgh University. • Attended a course on Finance for Non-Finance Managers by Dr. Hanif Mohammad, from School of leadership Karachi, in April, 2016. • Attended a course on Strategic Leadership of ICT in 2016. • Attended a workshop on Performance Management in August, 2015. • Attended a workshop on ETAC implementation in schools October, 2015. • Attended a workshop on Conflict Management in March, 2015. • Attended a conference on The School of Tomorrow in 2013 and 2018. • Attended a workshop on Managing Change in October, 2011. • Attended a 1 day workshop on ‘Assessment Writing’ in 2010. • Attended a workshop on Child Abuse in 2008. • Attended a workshop on Lesson Planning in 2008. • Attended and completed a Training Course in Evaluating Educational Institutions in 2006. • Attended the 2 day SPELT (Society of Pakistan English Language Teachers) Conference and workshop sessions for teacher training in 2013. 2009, 2007 and 2006.